It is indeed an extraordinary film. It is brilliant, inspiring and without a doubt the movie of the year. Nonetheless, it's not as novel as it seemed. Matrix talked about human brain as well. It displayed the virtual world of brain and the world of reality in a rather more striking manner. It was a huge success, in the light of building up morbid freaking-out gigantic castles that stores human bodies. I did not like the movie at the first sight, yet its powerful aftermath is undeniable. The tension between reality and imaginary world is the ever lasting struggle in history, well, precisely speaking, after psychology was created. When Plato indicated a world of ideas and a world of reality (which is therefore imperfect and not ideal), he somehow described a world that links our world and reason to the ideal world of the Creator. This is more than any human beings can ever imagine. This is a religious pursuit of something beyond our reason. Therefore, this imaginary world exists, not merely in our brain, but somewhere that is not conjectural as well. The invention of psychology degrades the link of human being and the Creator into merely neurocyte work inside one's own brain. Either the reality or the imaginary world are brain work, hormone, chemistry, stimulation and response. In this sense, everything could be, or, is unreal. This idea changes everything. Especially the nineteenth century, the great era of unparalleled success of the Industrial Revolution, this also changed people's understanding of themselves, the world as well as the universe. People's pride and confidence on reason of human being was so potent that the invention of psychology and the wholesale disbelief on religion was reasonably explained. A friend said Inception was very likely written by some on-drug screenwriter. It makes sense, totally. Dream is as well the inception of the whole movie, it trigger the imagination on human brain, neuroscience, reality and illusion, and many more relating to the world we created, in real life or in our brain. Everything begins with the idea that, as said in the film, one's mind can be accessed through his dream. Therefore the ideas can be stolen, and then the 'mind-thieves' went deeper. In this sense, what effects one's mind and personality is no longer from outside while from within. Once an idea is planted, it rooted, and will be extremely hard to be exterminated. This indicates how complex human brain can be, and how delicate an imaginary world can be created within one's mind. This also says how proud human beings can be. The Creator created the world in 7 days, and human beings create a timeless and space-less world that surmounts the real world. 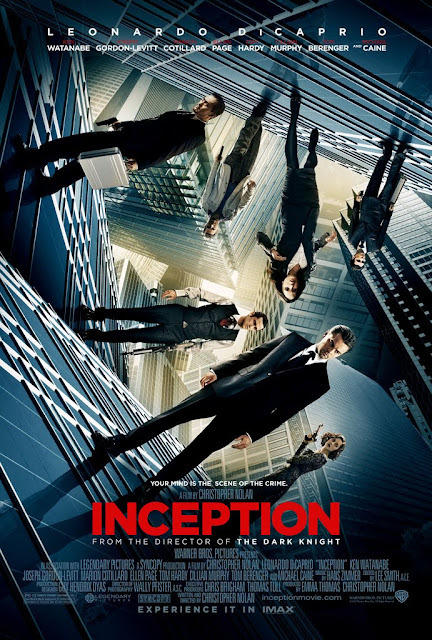 Other than the perplexing structure of dream in a dream (and in another dream), the plot of Inception is actually quite simple, and brilliant. It established itself as a great classic that goes beyond the genre of action, sci-fi and drama. Brilliant indeed.